Are Credit Card Chips Safe? While Americans are just getting used to cards equipped with chip technology known as EMV, the FBI already warned consumers that new cards are not completely safe and there are still a lot of ways that criminals can continue to steal information. It means that criminals are still targeting you and your new plastic cards so you can’t let your guard down. As security journalist Brian Krebs put it, the chip cards "simply raises the costs for the bad guys...It's not that they can't break the system — but it makes it more expensive for them to fabricate these cards." Nevertheless, this technology has been used in Europe for years and we are going tosee more chip cards across the U.S. soon. So how is the chip actually different and is it really better than our good old magnetic strip? Right now, when you swipe your card buying something, your personal information is first sent from the credit card machine to a computer in the store and then to the card company. A hacker can get enough information anywhere throughout this system and use it later to create a fake card or pay online repeatedly until you close this credit card. A chip card, on the contrary, generates new information for each transaction so that anyone who gained your card info when you bought something in Target could not use that information for any other transactions there or anywhere else. While it may sound great, credit card chips still don’t solve all existing problems with credit card fraud. 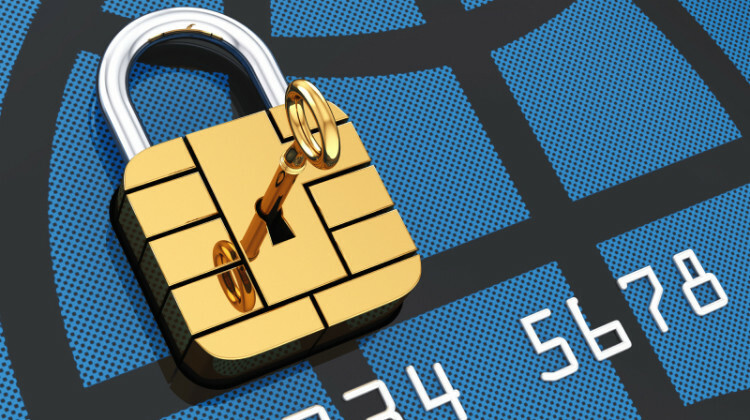 What makes credit card chip more secure? Because magnetic-stripe credit cards are magnetized and contain static data, it’s quite easy for bad guys to steal your personal information from it and clone it making an identical card. There is even a gadget called a skimmer, which they can buy for as little as $20 or make by themselves, that allow them to do it pretty easily. The information on chip cards, on the other hand, is constantly changing, making it extremely hard to extract and clone it onto a new card. To get your bank information, fraudsters would have to get into the physical chip circuit and manipulate things manually, which is really difficult and expensive. Moreover, it requires some high-tech equipment that can cost about $1 million so not everyone can actually afford it. The other difference is that magnetic-stripe cards put bank information into the payment terminal as it is and this information is encrypted as soon as it’s received. Chip cards are different because they have sophisticated encryption built right into the chip so instead of sending all of your credit card information to a merchant during the purchase, they generate and send a unique code that a hacker can’t use even if they steal it. If a hacker has this code and tries to use it make a fraudulent purchase, it will be like trying to use an expired password so, obviously, it simply won’t work. Just like with magnetic-stripe cards, the payment made with EMV card is processed in two steps: card reading and transaction verification. However, you don’t need to swipe your new card since EMV card is read in a different way. It’s the small chip you see in the corner of the card that changes everything. Now, all you need to do is just insert your card into a terminal slot and wait for it to process. Once the EMV card is dipped, data goes from the card chip to the issuing financial institution to verify the card's legitimacy and create the unique transaction information which is different each time. Because of this, the whole process won’t be as quick as a magnetic-stripe swipe. In order to make the payment, you’ll need to be patient – simple sticking the card in and polling it out won’t work. So, if you don’t want your transaction to be denied, it’s better to wait. While chip card transactions will take longer than magnetic stripe transactions, total card processing time will vary depending on the merchant, the equipment, and the point-of-sale system. Banks promise that eventually the whole process will speed up as the new system will be improved and adopted by different stores. In fact, card dipping won’t be the only option available to customers. Some EMV credit cards also support contactless card reading, which is also known as near field communication. The process will be pretty much the same, but instead of dipping or swiping, these cards can be tapped against a terminal scanner that quickly pick up the card information from the computer chip. Contactless transactions are generally easier and more consumer-friendly since all you have to do in order to complete a transaction is tap. As for today, there is a big move to make EMV cards contact and contactless at the same time. However, this technology is quite expensive nowadays and almost all banks, which are still working hard to successfully integrate EMV cards into the U.S. shopping scene, are issuing contact cards only. Experts think that in a few years, we will use contactless card reading more often and then will gradually move to using dual-interface cards that will be contact and contactless at the same time. This move will expand consumer options and is anticipating to make the whole process of using new cards easier. When you actually think about it, magnetic-stripe cards are pretty outdated — they’ve been around for more than 50 years! And, surprisingly, the United States is one of the last countries to still use them often. If you travel a lot, you may notice that the magnetic stripe that is so popular on American cards is seldom used in Europe now. Banks there have already made the switch. In fact, EMV has been the standard in most parts of the world for decades. EMV cards were originally designed to prevent fraudulent transactions that take place when someone swipes a counterfeit card when making a purchase. And new chip card technology actually works. Credit-card fraud in Europe has declined sharply since the introduction of chip-enabled cards, but there is a crucial difference in how Europeans and Americans use these new cards. There, consumers must enter a PIN number when making a credit-card purchase; in America, the chip-enabled credit cards only require a signature. This one small step adds one more layer of security making it more difficult to steal a card holder’s information. That’s why in the United States, where a PIN is not required to make a purchase, credit card chips won’t be as effective and secure as overseas. The “Chip and signature” system is well known to be less effective than “Chip and PIN” cards that are so popular in Europe. “We all know that nobody verifies signatures,” said Martin Ferenczi, president of Oberthur Technologies, a company that makes EMV cards. So while everyone agrees that your new chip credit card is more secure than one you had before, it’s still not the safest system possible, especially if you live in America. Why is the U.S. the last country to adopt chip cards? New type of credit cards, those that are embedded with a tiny microchip, are relatively new for Americans. The U.S. is making a change slowly during the past few years, but it’s a long process mainly because chip cards are processed differently — they’re dipped instead of swiped —and require new payment terminals to read them. But why didn’t the U.S. adopt them earlier? Come to think of it, chip cards are not new outside of the United States. Chip technology was introduced in 1980s and has been the standard ever since in some countries like the UK. According to the payment processing company First Data, nearly 70 percent of non-U.S. credit card terminals are now accepting credit card chips and this number is only growing. Since chip cards have proven to be super effective in fighting fraud abroad, it seems obvious that the U.S. should have made the switch long ago. To compare, Americans lost over $5.3 billion due to credit card fraud in 2013 and even more in the next few years. So what’s been holding things up for so long? One of the biggest reasons is the overall cost of switching out all our old cards and payment processing systems. In general, it will cost anywhere between 8 billion and 12 billion dollars for Americans! But this amount is not stopping Americans anymore. The big move began right after recent high-profile security breaches in Home Depot, Target, and other big retailers along with the increased difficulty in paying with magnetic-stripe cards outside the U.S. This has pushed the whole process onto the fast track. Many customers received new chip-enabled credit card already and chances are you’ll get one soon. Meanwhile, big retailers are investing in new payment terminals, a lot of ATMs across the country are changed, and banks are issuing thousands of new credit cards every day. Other payment processing systems like vending machines, self-service kiosks, and ticket terminals are also improved, and it’s already hard to find the cashier who has never heard about the new cards. Most cashiers in big stores are already equipped and personnel of the store will be happy to help you with the new credit card. In the last year, many card companies, banks, and credit unions adopted the new system and sent their clients new chip credit cards. However, they aren't making the shift out of the pure desire to help their customers and make the world a better place. Even though this change will benefit the consumers, banks have their own reasons to give up the magnetic strip cards. The thing is, fraud liability is investigated by the likes of MasterCard and Visa. Their goal is to discover who is most at fault and which party shoulders the financial burden. Under the new rules, the liability will fall on those who have the least up-to-date technology. Therefore, it’s in the best interests of banks, credit unions, retailers, and card companies to provide their customers with the newest and most secure cards available nowadays. Even though almost half of all the cards in the U.S. are transitioned already, consumers will still be able to swipe the magnetic strip cards for years to come as the industry can't possibly jump to 100% acceptance overnight. However, the change is inevitable – each year we are going to see more and more card chips and less good old credit cards. Is it for the better? We think so. Even though credit card chips are still not as safe as we wish them to be, it’s a big step forward for the U.S. Hopefully, we will witness a sharp decline in counterfeit card transactions soon since credit card fraud is trending way up in the U.S right now and something should be done in order to stop it.